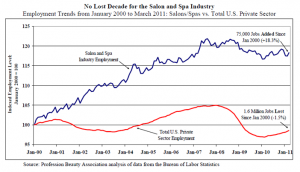 There has been a steady growth in the salon and spa industry over the last ten years, especially in the non-employer sector. 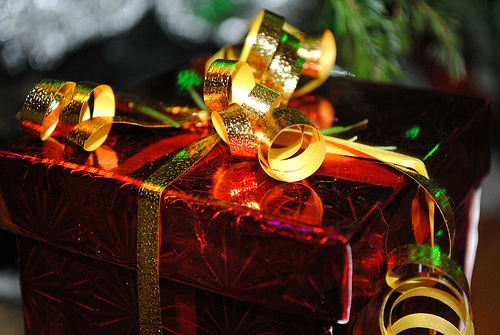 Non-employers are businesses that do not have any paid employees. This includes independent contractors who work from home, rent a chair in a beauty salon or have their own business, but do all of the work on their own without the support of a staff. 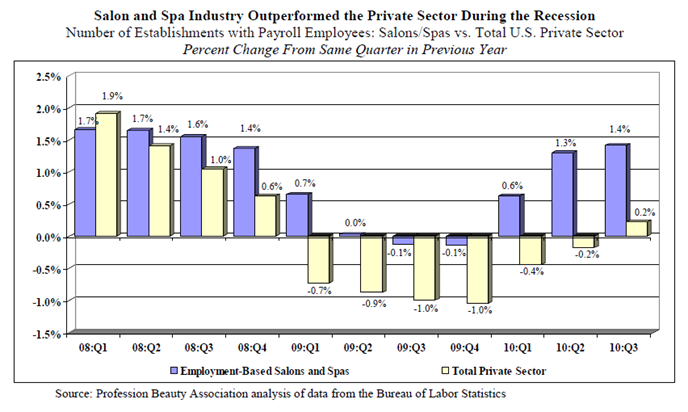 During the last ten years the number of non-employer salon and spa establishments increased 72% with an increase in sales of 116%. 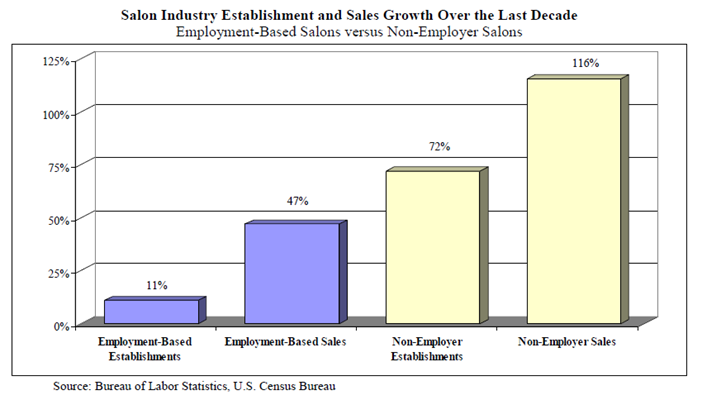 The number of employment-based salon and spa establishments increased by 11% with an increase in sales of 47%. 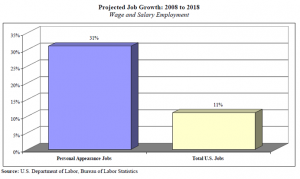 There were 1.6 million fewer jobs in most private job sectors between the years 2000 and 2011. 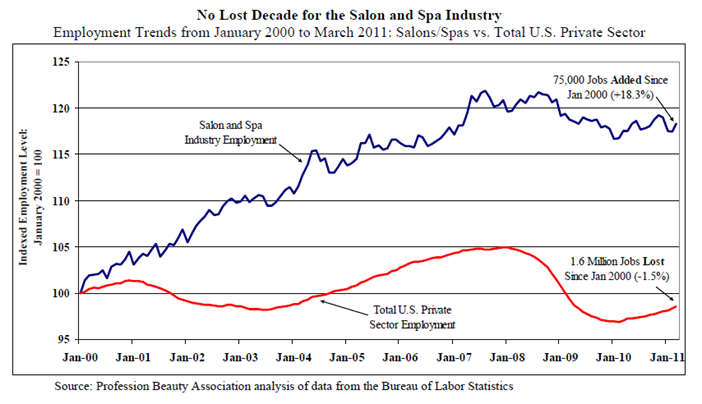 However, employment based salons and spas added 75,000 jobs during this time. 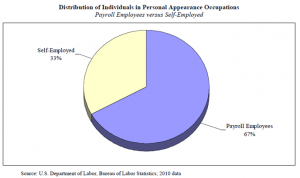 According to the Bureau of Labor Statistics more than 1.1 million professionals work in personal appearance occupations in the United States- 33% of which are self-employed. 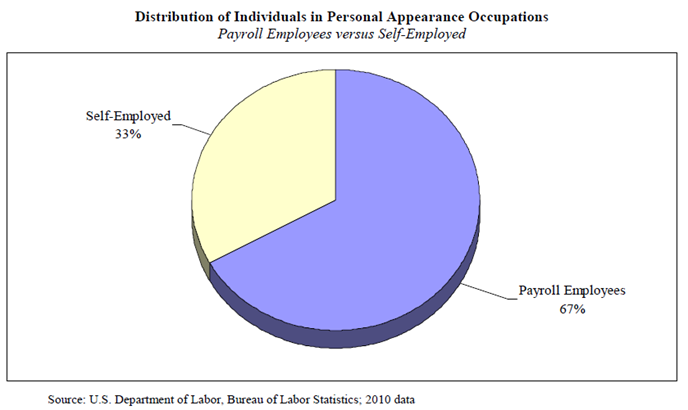 In comparison, only seven percent of the overall U.S. workforce is self-employed. 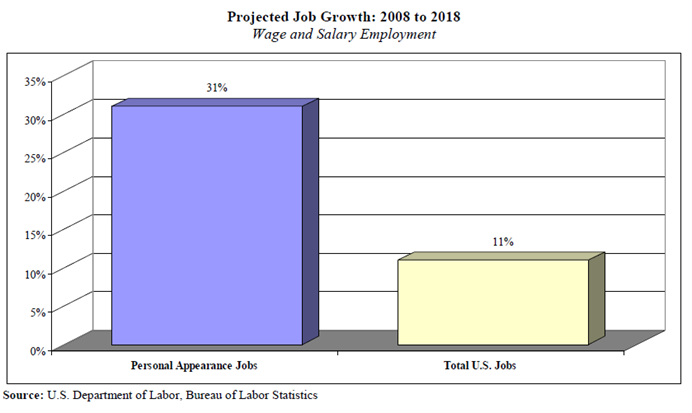 Of the 770,000 Hairdressers, Hairstylists and Cosmetologists, 35 percent (or 267,000) are self-employed. Barbers have the highest proportion of self-employed individuals, at 54 percent. While most industries are male dominated, the beauty industry allows women and people of many different backgrounds to run their own businesses. 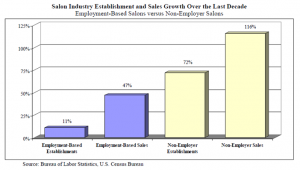 61% of salons are owned by women in comparison to 30% in the private sectors. 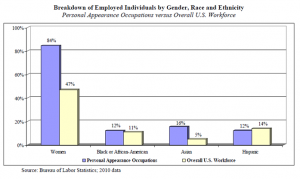 21% of salons are owned by African Americans in comparison to 7% of the private sector. 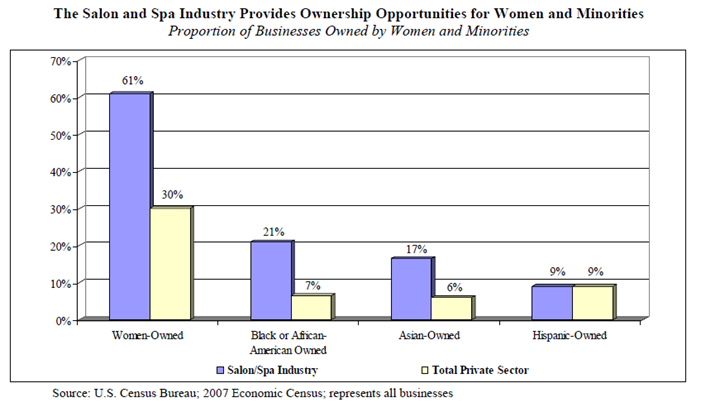 17% of salons are owned by Asians in comparison to 6% of the private sector. 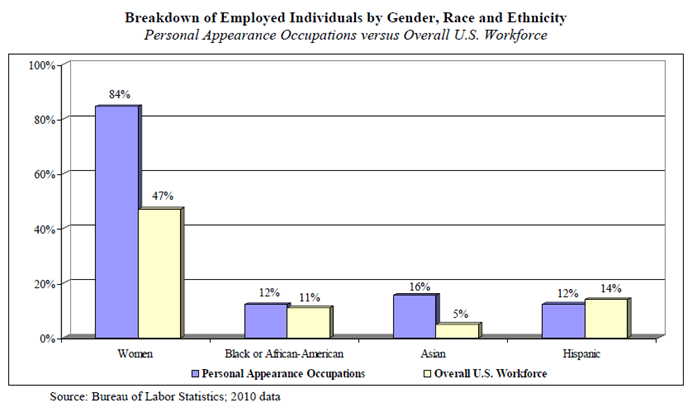 9% of salons are owned by Asians in comparison to 9% of the private sector. 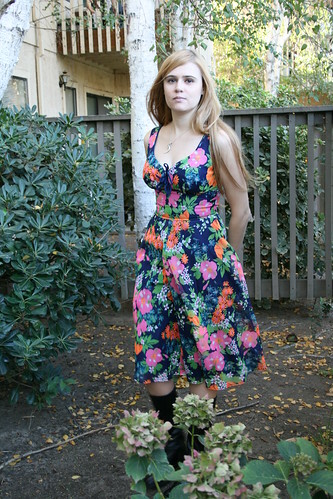 As you can see, the beauty industry is doing exceptionally well during the recession. It offers jobs at a time when other sectors are laying people off and allows people of all genders and ethnicities to grow and prosper.